Now and then, I happen across a program in state government that makes me wonder, what on earth were they thinking? And, usually, the answer is: They were thinking about politics. And that’s probably the best explanation of why politicians in Raleigh have made such lavish promises to provide health insurance benefits to state employees after they ‘retire’ – without setting aside a penny to pay for those promises. Now, when I say retire most people will think of someone who retires at 65 and signs up for Medicare. 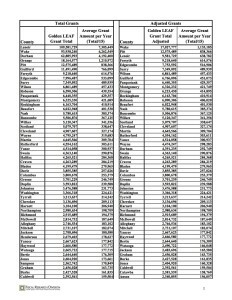 A state employee can work 20 years and retire and the state will go right on paying for their health insurance. For years. The state will even continue to pay for their health insurance if they take a job with another employer. My friends in the private sector, who have reached 65, tell me hitting the age of Medicare is like walking into the Promised Land. Not only are basic Medicare benefits well beyond what they had been paying for with their own insurance – they’re free. And, if they want, they can buy additional benefits (say, to pay for all their prescription drugs) for a fraction of the cost. A state employee who goes on Medicare at 65 gets an even better deal: The state will provide whatever supplements or additional coverages they want and it doesn’t cost them a penny. They get Medicare free. And additional coverages free too. Which leads to an inevitable question: How much are all these promises going to cost taxpayers? The answer: $26 billion. Which is what state budget writers are euphemistically calling an ‘unfunded liability.’ And what the rest of us simply call a debt. Let’s put that $26 billion in perspective: I remember the debate, two years ago, when we found ourselves facing an inherited $2.5 billion debt to the federal government for unemployment insurance. Now we face another debt that is ten times as big. No one questions taxpayers providing health insurance to people who work for the state – but spending $26 billion to provide health insurance to people who don’t work for the state? It’s time for a serious talk. I’ll admit if I was a genius at stock market timing, I might not be serving in the NC Senate. I also suspect the same holds true of most folks serving in state government. So it’s interesting to watch the ongoing debate in Raleigh over how to fund NC’s long-ignored infrastructure needs. One side says now is the time to borrow a couple of billion dollars – because interest rates are low and cannot go lower. That may be so. But, then again, it may not. While market timing is tempting, as a lot of folks have learned the hard way, it’s also risky. And when it comes to borrowing a couple of billion dollars it’s hard to ignore gathering clouds on the economic horizon. While Greece gets most of the recent headlines, it’s also a fact that the stock market in China has lost about a third of its value since mid-June. And the drop in industrial commodity prices, like oil and copper, suggest the world economy may be slowing. At the same time, both the wizards of Wall Street and the typical American family are reducing debt . In fact, the only sector actively adding to its debt burden is government. I don’t pretend to know if this is the right time to borrow billions – and I’m not sure anyone else does either. Another option is to redirect roughly $900 million currently held by the Golden Leaf Foundation and use that money to pay for the same infrastructure projects. That sounds a lot safer than borrowing. In other words, NC taxpayers have close to $1 billion in cash on hand – so why take on the risk of borrowing? 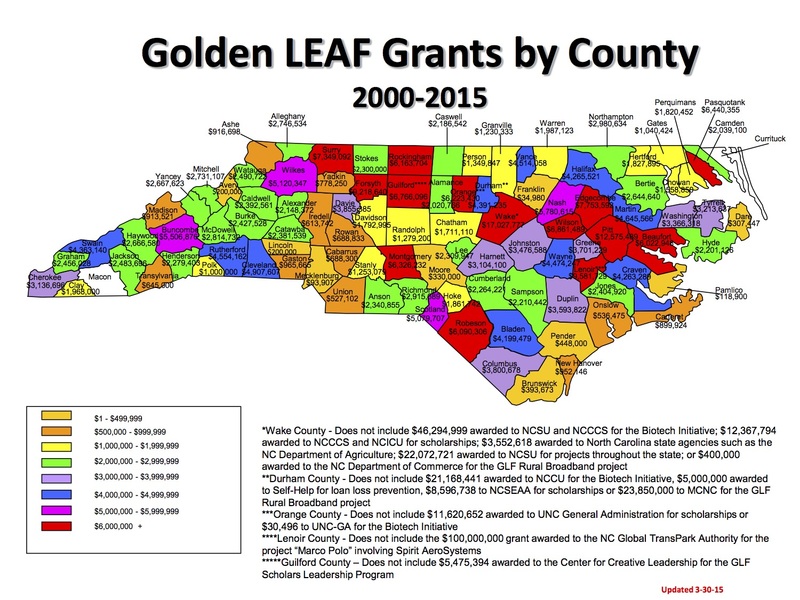 I realize some will protest (loudly) that Golden Leaf was supposed to help rural areas that were dependent on tobacco, but a review of their grant allocations by county show some pretty prosperous counties – like Wake and Durham – at the top of the list. And there’s another consideration. Several state leaders are actively promoting a new tax structure because they want to shift sales tax dollars from urban to rural counties. But, if we are going down that road, we can surely eliminate the special programs buried in the labyrinthine state bureaucracy – like Golden Leaf – that were set up to accomplish the same goal. Let’s make those infrastructure improvements. But let’s do it with available cash, not by increasing a debt burden that will quickly weigh on current taxpayers as well as future taxpayers. Click each for a closer look. One item – that comes with a $26 billion price tag – in the Senate budget is getting plenty of attention. In fact, the rhetoric – from the State Employees Association and the Teachers Union and liberal groups – has gotten so heated one spokesman went so far as to suggest that, if this reform stays in the budget, we may never be able to hire another state employee. Here’s what the ruckus is all about: Currently, state employees receive first class health insurance. And they receive two additional health insurance benefits: First, after working 20 years, and after reaching age 50, a state employee may retire and the state will continue to pay for their health insurance. Second, if the same employee decides to go to a new job, the state will still continue to pay for his or her health insurance – instead of their new employer. Those are the provisions the Senate proposes to change – for people who will be hired to work for the state after Jan 1, 2016. What this means is straightforward: As long as a new employee works for the state he or she will receive the same first class health care benefits as every other state employee. However, if he or she changes jobs (after working 20 years and after reaching age 50) the state will no longer pay for their health insurance. Their new employer will have to do that. Or, if they decide to retire early, they will have to pay for their health insurance themselves. There’s one other argument in favor of this change. For years, the state has made commitments to pay employees and teachers pensions. And each year, the state has set aside funds to pay those pensions. As a result, the state’s pension plan is well funded and rests on a solid financial foundation. However, state health insurance benefits are different. The state has never set aside a penny to pay for these benefits and, as a result, the state now has an unfunded liability of $26 billion. We’ve dug ourselves a financial hole. Should we keep on digging or start climbing out? The Senate’s proposal is fair to both employees and taxpayers. And – with a $26 billion unfunded liability – it’s the right thing to do. Mooresville is thirty minutes north of Charlotte, and Rock Hill (South Carolina) is thirty minutes south of Charlotte – thirty minutes that is, as Google Maps puts it, “without traffic.” And there’s the rub. When you leave Rock Hill heading for the big city, Interstate-77 is an 8-lane boulevard. When you leave Mooresville, it’s a 4-lane bumper to bumper parking lot. The NC Department of Transportation needed – and came up – with a solution: To get a private business to build two additional lanes and, in return, let them collect tolls on the new lanes. The idea received, at best, mixed reviews from NC commuters who would be paying the tolls. And, then, the process took a decided turn for the worse. At the last minute, after the contract was signed, legislators learned there was a big surprise buried in the fine print – a non-compete clause. A clause that said NCDOT cannot, for 50 years, add additional lanes to I-77 where the toll lanes run. And if they do, NC taxpayers will have to pay damages to the toll-collecting corporation. So if we decide our side of I-77 should be as wide as SC’s side, NC taxpayers will not only pay for the road construction, there will be an additional ransom for adding those lanes. In the meantime, nothing stops SC from adding more lanes on their side whenever they want. There are two lessons to be learned from this: First, maybe something other than incentives is luring companies from NC to SC. And, second, when state bureaucrats sit down at the table to negotiate a contract with eagle-eyed MBAs, the taxpayers will likely be the dinner. Last week we saw how a manufacturer – in this case Volvo – announcing it’s going to build its new plant in SC instead of NC ignites editorial writers and creates a firestorm of finger-pointing. But amid the bloggers’ cries of “why not us” two facts have been ignored. First, giving Volvo (or any new industry) $200 million in tax breaks means that someone else has to pay for the cost of streets and sewer lines and infrastructure to support their new business. New development, especially huge new developments like this one, increase what government spends on roads, schools and other public facilities. Politicians who favor incentives will argue that, in the long run, those costs will be offset by future taxes the business pays. But it’s also a fact there will be a short-term deficit that has to be funded by taxpayers. The second issue is more subtle. And has to do with fairness. In 2013, so NC could better compete with our neighboring states, the General Assembly reduced personal and corporate income tax rates. But later, after the dust settled, we learned an odd fact: A little known glitch in the state tax code is actually increasing taxes manufacturers pay on job creation and investment in our state. Right now, NC doesn’t just tax our manufacturers on the products they sell in NC – we also tax them based on the number of workers they employ and how much they invest in plants and equipment. 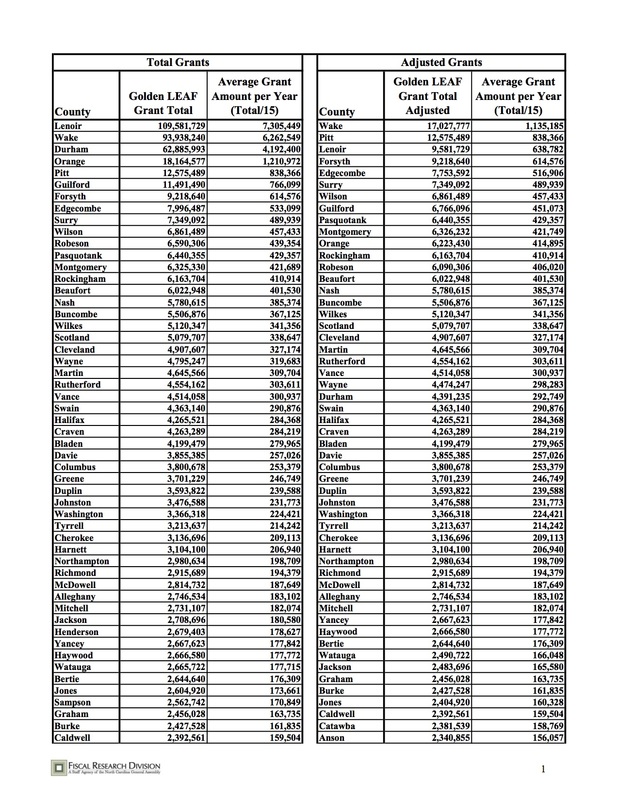 Other states – like SC – don’t have those additional taxes. And if we eliminate them here, we will also eliminate a big reason the state has to hand out cash to get a manufacturer – like Volvo – to build a plant in NC. Consider this hypothetical example: A manufacturer who has a plant in NC sells its products all over the world. Under the current law, let’s say the additional taxes it pays – for creating jobs and investments here – are $10 million a year. Going to the single sales factor (and just taxing manufacturers on NC product sales) will give that company 10 million reasons to create jobs in NC. It’s not a new idea. For years we have allowed banks and utilities to use single sales. Why not allow it for the businesses offering the fastest route for working families to move from poor to middle class? Single sales is not only smart tax reform – it’s fair. Because instead of helping a select few corporations with special tax breaks or cash incentives, we help every manufacturer, whether they are new to our state or have been here 100 years, do the very thing we need: Hire and invest in NC. Here’s another way facts get twisted and political debate goes downhill. A politician, making a speech, says, ‘Solar energy gets a special tax break – an 80% exemption from property tax.’ It sounded innocent enough. It was, technically, correct. But the politician left out part of the story. Next a blogger, bent on lambasting solar energy companies, took the politician’s half-truth and twisted it again and wrote it was an outrage solar companies only pay property taxes on 20% of the land they use. And that’s how political debates go downhill: From half-truth. To twisted half-truth. To outright fiction. Here’re the facts: Solar energy businesses do receive an 80% property tax exemption on the power generation equipment they own. But they receive no exemption at all on land. They pay those property taxes just like everyone else. But that’s not all of the story. Here in Catawba County, 35 acre solar facilities have been built on agricultural land. Prior to their being built that land was taxed at a special rate for ‘farmland’ – a special rate that set the value of the land (which determines how much tax is paid) at $300/acre. Installing a solar facility did two things: It took the land out of the special farmland category, thereby raising the land value for tax purposes back to current land values of approximately $3000/acre. And it changed the land use to an industrial use which pushed the land’s tax value up even more – to $10,000/acre. In other words, the county’s tax base increased from $300 to $10,000 per acre. On 35 acres that’s an increase from $10,500 to $350,000. Next the Solar Center adds $20 million in equipment and, after it claims the 80% exemption, ends up paying taxes on $4 million in equipment. Which means that tax value of the 35 acre site increases again – going from $10,500 to $350,000 to $4,350,000. A 400 fold increase. Which means the property taxes the county collects on the site go up 400 fold as well. When all is said and done the solar company has converted a 35 acre vacant field with no water and sewer service into a business that adds $4.35 million to the Catawba County tax base. And without having to build schools and police domestic disputes. But, then, a blogger writes it’s an outrage solar companies don’t pay property taxes on land. That’s an example of how politics becomes broken. Here’s one reason people are disgusted with politics. Earlier this year, I introduced a bill in the Senate that said two things: Teachers should not engage in partisan political activity – like supporting a political candidate – during official working hours, and should not use school equipment or supplies for partisan political activity. That didn’t seem controversial but the NCAE union opposes my bill. Now, in fact, in plain English my bill states that teachers have a right to support any political candidate they want on their own time, and prohibits supervisors interfering with that right. And that’s an example of how politics falls apart. A special interest lobbyist twists the truth. Then one of their union leaders twists it a bit more. And, before you know it, what’s being said is the direct opposite of the truth. Here’s a simple fact: When the legislature eliminates a tax loophole for a special interest it can lower taxes on everyone else. Here’s one more fact: When the legislature tries to eliminate a loophole, the special interest hollers – and hollers loudly. There’s not a great deal of difference, in the real world, between a multi-million dollar for-profit hospital and a multi-million dollar ‘not-for-profit’ hospital. Carolinas HealthCare System is an example. It’s one of North Carolina’s largest hospitals. And it’s a ‘non-profit.’ But it operates very much like a for profit business. It pays its CEO $5 million a year – just like large for-profit businesses pay their executives. It has multiple executives who earn over $1 million a year. And it even has a fleet of corporate jets and airplanes. Big ‘non-profit businesses’ like Carolinas HealthCare System actually have little in common with traditional charities like the YMCA, Boy Scouts or a local church. But under our tax code they are treated the same. For instance, just like traditional charities they do not pay sales taxes (a tax exemption that dates back to a much earlier time when a local hospital was just that – local). Senate Bill 700 addresses the reality that major ‘non-profit hospitals’ are actually no different from multi-million dollar businesses and that, like other businesses, they should pay sales taxes. Before I go any further I should make one other fact clear: As a former President of the Boy Scout Council, and chair of the YMCA and a Board of Deacons, I have seen what traditional charitable organizations mean to our communities. This bill doesn’t affect the typical local Boy Scouts or YMCA – in fact, no charity that purchases less than $1.4 million in goods will pay one penny in sales taxes. None. Instead, the goal of Senate Bill 700 is to close a tax loophole that allows big ‘non-profit businesses’ to avoid paying sales taxes – and to use that revenue to cut taxes on everyone else by $225 million. That means we could increase the standard deduction for a married couple by $2,000, so they would pay no taxes on their first $17,000 (up from $15,000) of income. The bottom line is simple: What makes more sense? To give multi-million dollar ‘non-profit corporations’ a tax break so they pay no sales taxes? Or to close the loophole and lower taxes on working families? Amidst all the posturing in the debate in Raleigh over how to divide sales taxes between counties, I keep hoping to hear the answer to one question: What’s the right thing to do? Here’s how our current ‘sales tax distribution system’ works: Let’s say a customer pays $10 in sales taxes. All $10 goes to the state, which keeps $6.90. Of the remaining $3.10, $2.33 goes back to the county where the sale occurred, and the other 78 cents is divided among all counties based on their population. The General Assembly is debating how to change the way the $3.10 – that is divided between NC’s 100 counties – is allocated. The problem is simple: When we allocate 75% of the $3.10 by point of sale, it favors urban centers like Charlotte and Raleigh. They get a lion’s share of the money. And, over time, that’s left other counties between a financial rock and a hard-place. When their residents drive to, say, Raleigh to shop, local dollars not only leave their economy, the sales taxes they pay in Raleigh stay in Wake County – instead of returning to their home county. That has left many counties struggling, needing money for schools, with little choice but to raise property taxes. In many counties, property taxes have now hit the roof – which has left them struggling to compete with their more fortunate, urban neighbors. That’s why the General Assembly is debating how to change the ‘sales tax distribution’ formula. The battle lines were quickly drawn. Of course, large urban counties who will lose funding don’t like the new plan – they argue shopping malls cost them money for infrastructure so they deserve more of the sales tax money. There’s some truth in that. But it’s also true the formula heavily favors urban counties. Folks on the other side argue the system is unfair and broken and no money – at all – should be allocated based on point of sale. Every penny their residents pay in sales taxes should be returned to their counties. The fact is the current formula for distributing sales tax distribution isn’t fair. But it is also a fact that there are some costs associated with being a regional shopping destination. Those two facts have to be weighed and balanced. And that’s what’s missing in this debate. Swinging the pendulum too far one way or the other will simply create more unfairness. There is usually a point between too little and too much. We need to find it.